Hello! Week 3 of the Share Handmade Kindness Challenge is all about kids. This week is a bit different. In addition to the kids in our lives, we are going to help out two kids who really need smiles. I strongly believe the best way to teach kindness is to give kindness. Actions speak louder than words… especially with our youth. Participating is easy. Simply make something with a child and/or GIVE something to a child. It can be a card, sweet treat, handwritten note, a picture – anything made by the hand, from the heart counts. Simple! Any child of any age counts! This includes young folks in your family, local schools, churches, shelters, hospitals, etc. I also encourage you to get your kids or any young folks in your life involved in participating this week. I think you will all love it! Also – remember – I will be back soon with info on sending cards to some kids facing challenges. You can do that too. 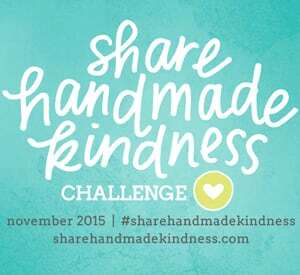 Post a photo of whatever you create on social media with the hashtag #sharehandmadekindness. To celebrate this week’s challenge, I have THREE great prizes to give away. These three folks were very awesome to offer these prizes. Please consider checking out their products. They make our industry great! If for some reason you can’t participate, no worries. I will continue to have other random giveaways throughout the week! Are you playing along in tee challenge? If so, feel free to grab a badge HERE to share on your blog or social media. As I mentioned, you are welcome to link here to share your project to inspire others. This is optional! It is easy – you can watch THIS video if you need some help. I will participate in each and EVERY single possible way!! Posting pics soon!! ???? I have been trying to downsize in my craft room this fall and I hung a bag on my doorknob and as I come across little bits and pieces I dropped them in the bag, and when the bag is full I deliver it to my friend who has a 6 year old granddaughter. She recently told me that they had a ball creating cards for her to give to her classmates! I made a card for both of my boys ages 8 and 5. They love to receive anything handmade and they enjoy making things for others as well. I used all my little scraps of paper (that I couldn’t throw away) and punched out all kinds of shapes–flowers, butterflies, trees, hearts, etc. Today I will deliver them to: a Day Care Center and a home day care. I included small pieces of paper so that the kids can glue/paste the shapes to make a picture. I have been participating in your challenge and will be participating in this week’s challenge as well. I have enjoyed seeing the smiles that it brings to the people that have been the recipients of my little gifts. I plan to do this on a more regular basis because it makes me feel good, too. I think I’ll reach out with handmade cards to my kids (related) and an elder (unrelated). Thanks for giving people who have a smaller web/media presence a way to enter your contests. I know a couple teenager who I think need some encouraging words at our church. Love this challenge. Off making teenager friendly cards……..
My daughter is reading a book about quilts and sharing to her daughter’s 1st grade class. She is going to help them make placemats to use at their Thanksgiving feast. They will use pieces of colorful paper (that I have pulled from my stash and cut into pieces) to glue into a turkey shape on brown paper then have laminated. Good way to use up my stash and give them something fun to use over and over again. I’m sending a card to a fabulous 9 year old girl: she is bright and vivacious but having a tough time with her peers because she has a cleft pallet. Though it is being corrected over time, she is very self conscious. She loves pink and all that sparkles so it will give me a chance to make a dent in my sequins stash! Thanks for all you do. I have made a snowman countdown till Christmas for each (2) of my grandchildrens families. Kyler kept asking the whole month of October when Halloween is. I thought this would help his parents out and he will love moving the hand of the count down. I had Kyler and Keaton help make glitter ornaments pictures to come on CC facebook post this week. I am putting a cursive alphabet of our employees name with a block of whole mane and year on the back. Ornaments all glittered and I’m almost done. Just want to say I love your youtube video’s! This morning I made a large batch of chocolate chip cookies. I took a plate over to lady across the street with 5 children, also took a plate over to the elderly lady directly across the street, and lastly I took a plate to my neighbor for the dozen eggs she gave me. Love this kindness program. I just sent friend’s 3 kiddos all cards! All with kind and encouraging words!!!! I have entered this contest with a card I made for my son’s girlfriend who is away for 9 months. She loves getting my cards and says it always puts a smile on her face. I am sending cards to my two nieces who just found out that they are going to be big sisters next year. I love sharing handmade kindness with my Make A Wish Kids. I’ll also participate in the card shower later in the week. Thank you for all your inspiration and opportunities to share our creations with other communities. My girls in my 4th grade Girl Scout Troop thoroughly enjoyed making Get Well cards last week. We plan on visiting the children’s wing at the hospital the week before Thanksgiving. We wanted to bring a little cheer to the kids who won’t be home for that holiday! Thanks Jennifer, for reminding us all to share kindness and gratitude with each other! Jennifer, you really do inspire & move people to do for others! As a mother of six grown children. I have been blessed that they learned the lesson of kindness & giving from their father & I. We now, mostly I. are teaching our four grand children to do the same. I have a so. & daughter who both serve in the army, giving of themselves everyday! So. This weekend my eldest grand daughter wrote a letter to the troops and the other grand children colored pictures. I do t have a large craft section yet, I working & waiting to get started in making cards. but in the meantime. We all worked on putting gift bags together for children we know for Thanksgiving. This is only a little something compRed to what we do for the kids at Halloween. Christmas, time, my grandchildren help with adopting a child or too from Walmart & our church. If I can financially do it. Thank you for allowing me to share what we do and maybe next time I will have pictures for you! For my stephsons birthdag (12 years) I made a painting : he was reading a book that really caught him so I painted the ship in the book (big part of the book takes place on the ship) on canvas for him. I made CD cases into Tic Tac Toe games for children in the hospital during the holidays and will be taking a box there. We are making blankets for my cancer centers special group support program which works with kids of parents with cancer-they need help dealing with this family crisis. The 2 sided blanket with color the child chooses to face outward ,tells if they are sad today (blue) or they can choose the other pattern side which is expressing I’m ok today. Sometimes they just don’t want to continually be asked how they are & this lets them express what they are feeling. I recently created handmade cards for the young ladies (10-13) at my church. I hosted an Ice Cream Social at which we bonded and talked about Identity (who they are according to Jesus Christ). As a result a ministry was born and I have been promising them another day just for them. Unfortunately due to scheduling conflicts I have not been able to fulfill the promise. So I decided to make them some “thinking of you” type cards in which I thanked them for their previous attendance, reminded them that I haven’t forgotten about a new date, and encouraged them in the mean time. I used Paper Smooches Kudos Two “You are beautiful” sentiment to remind them that God (and I) say they are just that. Done Done and Done!! I posted a cute little Thanksgiving card made for my Nephew. I want to do the card shower as well!! The card shower sounds like a wonderful project. Thanks to you and your family for taking this project on. Apart from the card shower, I will be making one card in particular for a friend’s 10 year old son. They are moving to Canada after giving us the best memories for 7 years. It is going to be a huge change for him but he is also excited. My daughter who loves to watch your videos always looks at them and asks me, ” Can you make this card for me for my 5th birthday. So I will make something for her too. I’m knitting a baby blanket for my grand niece. It will be done by the end of the week. I make monthly cards for shareacard.org. Currently, there are 10 children on the list (along with the adults; I make cards for all on the list). My goal for Christmas is 150 extra cards to send. They are made and I have them at work where I lasso everyone who comes in to sign one. I give away many of the crafts I make, and kids are the most fun. My 9 and 14 year old boys are helping me make little treat baskets decorated with a turkey to thank their aunt for hosting Thanksgiving!! We’ll put one at each place setting. Great idea… sometimes a little sweet note is what my child needs when they wake up, or find one in their lunch bag. My three granddaughters and I are making name cards for Thanksgiving dinner. I created a card for my little neighbor Benjamin. He is having a birthday AND just found out he is going to be a big brother, exciting times! I knit sweaters and stocking caps all year for the Knit-for-Kids project through World Vision. They are sent all over the world, including within the USA, to kids in need. My 3 1/2 and almost 7 year old grandsons and I painted some wood boards my husband and I had sawed and put together. I will add some stencil lettering and they will help finish up by stenciling a big gold star and then waxing the finished project. These will be for Christmas presents for their mom and dad, along with the grandparents and great- grandmas. We have done some project each year since the oldest one was almost 2 years old and informed me at that time he was ‘the world’s greatest painter’. After last year we have decided no more projects will involve glitter. Thanks for all your inspiration. Going to send my 3 grown kids cards. My granddaughter and I will work on little Christmas gift bags for her cousins. Thanks for your ideas! I’ve started making some turkey cards for Thanksgiving and will send them to my nieces and nephews this week. I love sharing cards with children, and I know they all love to receive mail! We had two of the grandkids today and we worked on their bunkbed with them. They are helping us build it, with a lot of distractions! It’s been all kinds of fun and a great learning experience for all of us! as one other, I, too, have a bag on my craft-room door where I put items no longer used to give to 2 of m grandkids, much to their delight! so good too. to see these items much loved all over again! My son’s girlfriend’s daughter loves to be crafty and she wanted to make my mom a birthday card. We had limited time but I have a kit of parts that she was able to use to put together a sweet birthday card. I was tempted to tell her there was no time as we had to leave in fifteen minutes but it really made her day that she could put the card together. I’m making advent calendars for my nieces and nephews this year. Also, if we have time, the plan is to make ornaments for them as well but as a joint activity with the kids. My son works for Hospice. He has ask me to help get some Christmas things together they’ve enjoyed at home to use in putting together a Christmas Party this weekend including Santa, for a four year old child who will be in Heaven with our Father before Christmas gets here. Many folks are making things to make this a very special day. I’m excited about this week’s challenge! I will be participating in the card shower and hope to also make cards for 2 special little guys in my life. Thanks again for initiating a wonderful challenge! Hi Jennifer! I’ve already created gifts for 4 kids of a friend. Her husband was abusive, and she took her kids and left him. She struggles to make ends meet, and her kids struggle emotionally. So I used the idea I saw on one of your posts about sunshine gifts. Only mine are called holiday gifts and includes mommy. Mommy got some pampering gifts, but also a grocery gift card. Through kids got fun stuff. They won’t get it until the holiday because I want them to have PLENTY of gifts to open. I do this because I remember being in a similar position with my 2 kids, and God provided when we needed it. So, we MUST give back when we can. First Card Drive Prize Winners! Woohoo! I have the CDs!